A supernova could have shot matter into the early solar system, a new study shows. Two NASA space telescopes have helped solve some of the most enduring mysteries of the first documented report of star explosion — an ancient supernova spotted nearly 2,000 years ago, scientists say. In 185 A.D., Chinese astronomers witnessed what they called a mysterious "guest star" that appeared in the sky and lingered for about eight months. It wasn't until the 1960s that scientists determined that this cosmic object was the first documented observation of a supernova that signaled the violent death of a distant star. Now, infrared views of the supernova from NASA's Spitzer Space Telescope and the Wide-field Infrared Survey Explorer (WISE) reveal that the star explosion detonated inside a region of space that was relatively free of gas and dust. This allowed the star's explosion to travel out much farther and faster than expected, researchers said. Williams is the lead author of the new study, which is detailed online in the Astrophysical Journal. The ancient supernova, called RCW 86, is located about 8,000 light-years from Earth. But while its location was known, much of its details were shrouded in mystery. One enigma is the fact that the star's spherical remains are larger than expected. If the star's exploded guts could be seen in infrared light in the sky today, they ywould take up more space than the full moon, researchers said. By combining the new data from Spitzer and WISE with existing information from NASA's Chandra X-Ray Observatory and the European Space Agency's XMM-Newton Observatory, astronomers were able to grasp the missing pieces of the puzzle. They found that RCW 86 is a so-called Type Ia supernova, triggered by the relatively peaceful death of a star similar to our sun. This star shrank into a dense star called a white dwarf before siphoning matter, or fuel, from a nearby companion star. The white dwarf is then thought to have exploded in a brilliant supernova explosion. The study showed for the first time that a white dwarf can create a cavitylike empty region of space around itself before exploding in a Type Ia supernova event. 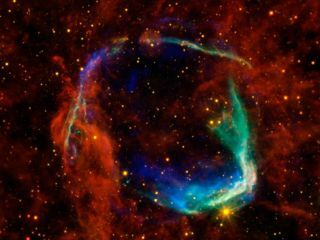 The presence of a cavity would explain why the remnants of RCW 86 are so big, researchers said. When the explosion occurred, the cavity would have allowed the resulting ejected material to spew out unimpeded by gas and dust. This would also have allowed the star's remains to be cast out rapidly. Using Spitzer and WISE, the researchers measured the temperature of the dust that makes up the RCW 86 remnant. They then calculated how much gas had to be present inside the supernova remnant to heat the dust to those temperatures. Earlier, scientists suspected that RCW 86 formed from a so-called core-collapse supernova, which occurs when a star's core reaches a tipping point mass and implodes. Core-collapse supernovas are the most powerful type of supernova. While there were hints of a cavity around RCW 86, at that time the phenomenon was only associated with core-collapse supernovas. In these cosmic blasts, massive stars blow material away from them before they explode, which carves out dust-free voids around them. Yet, Williams and his colleagues were able to rule out the possibility of RCW 86 being a core-collapse supernova. X-ray data from Chandra and XMM-Newton indicated that the object consisted of high amounts of iron, which is traditionally a clear indicator of a Type Ia supernova. Combining these observations with infrared data, the astronomers were able to show that RCW 86 was a Type Ia explosion in a cavity. "Modern astronomers unveiled one secret of a two-millennia-old cosmic mystery only to reveal another," said Bill Danchi, Spitzer and WISE program scientist at NASA Headquarters in Washington, D.C. "Now, with multiple observatories extending our senses in space, we can fully appreciate the remarkable physics behind this star's death throes, yet still be as in awe of the cosmos as the ancient astronomers."